Here is a video where I explain how to assemble the Finger Starter in French. You can select subtitles in the youtube parameters for other languages. By the way: Important information concerning the Text to Speech service Acapella that we used in our scripts!! Acapella Group has added some restrictions concerning the use of their demo page, therefore we can no longer use Acapella voices for our robots. So fortunately we can use MaryTTS which is an OpenSource Text to Speech service already implemented into MyRobotLab. If you are using my scripts you will need to replace or modify some variables in the parameters. Then replace in the ligne 92, “AcapelaSpeech” by “MarySpeech”. This entry was published on December 9, 2016 / Gael Langevin. Posted in Uncategorized. Bookmark the permalink. Hi, inMoov is a great work! I recently got a 3d printer and I am printing the hand and forearm, waiting for servos. I have zero experience in 3d design, I am learning Sketchup, but there are so many 3d softwares that I don’t know which fits my need, can you tell my what softwares do you use in designing inMoov? 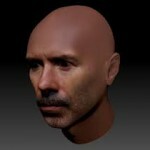 Good idea to get your hands on 3D modeling! I create all the InMoov design with Blender Open Source software. It’s a complex software which requires to learn through video tutorials because nothing is obvious at first sight. But it works with Python which is a great plus because InMoov software MyrobotLab uses also Python. So it’s a complete transversale integration.